Yesterday the SCVWS plein air group went to Morgan Hill, a town just south of San Jose. It's a little country town metamorphosing into a sprawling suburb, struggling to hold on to its history and maintain the character of the small "downtown." 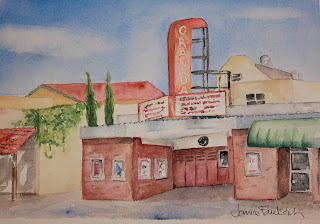 There's a move to save the Granada, an arte moderne style theater. Local arts groups have been invited to come and paint it. The paintings will be offered for sale at a party with food and music in 2 weeks. I don't plan to enter my painting, as it has several egregious flaws. Sadly, the original stucco of the facade has been covered with an ersatz brick veneer, but the curving aluminum band around the top is still there, as well as several other architectural features that give it more personality than all of the mall multiplexes that have replaced places like the Granada.